Up in the irrigated fields of north Victoria, North and Sons is at the coal face of managing some the vast network of water channels that farmers rely on. Ron Horner reports. A recent trip down the Murray River in northern central Victoria had me parked up around Echuca for a week or more. The marvellous Murray, stunning steamers, amazing antiques, beautiful buildings and historical houses are everywhere, but it’s the only place in Australia where if you head west you find north. North and Sons, from out near Gunbower, that is. Dougie North has been around for a long time. A Leitchville local who grew up in the bush and worked for the multinational milk co-operatives at Leitchville before entering fulltime into the earthmoving industry some 30 years ago. Leitchville, Cohuna, Gunbower, Kerang and Echuca lie in some of the richest irrigable agricultural country in Australia. Surrounded by literally hundreds and hundreds of kilometres of irrigation channels constructed back in the 1930s and smothered in rich alluvial Murray River flood plain soil, the region could grow babies overnight given the correct conditions and sufficient moonlight! If you are of the land, this seems like a perfect region where water is in abundance, cropping is relatively easy to manage and dairy cattle live an idealistic life of plentiful good tucker and the best water in the world. Water is transferred via elevated man-made irrigation canals that are graded from a high point to a low point, controlled by a series of lochs, interconnected at certain intervals and filled via gravity or pumps from a major water source such as the mighty Murray River. As these irrigation canals cross into a private property the owners can access water for a fee and use it for cropping, farming, stock or private use. As the canals usually sit higher than the outlying land the water can either be pumped or syphoned into the paddocks for flood irrigation of the laser levelled cropping paddocks, thus ensuring an even amount of water to spread across the whole area. Controlling the water and subsoil moisture content of the land enables the irrigator to have better knowledge and prospects of a profitable outcome and avoid the disastrous effects of prolonged droughts. The upkeep of these canals is an on-going and tedious task, which requires money, machines and men because as soon as you let the maintenance fall you can find that irrigation banks will blow out and the area could become completely flooded, vegetation growth becomes excessive and slows the rate of water inflow, and the speed of inflowing water, plus additional erosion of the banks caused by natural precipitation, requires continual building up and re-shaping. Over the years, excavators and graders have proven to be the best machinery to execute such remediation and on-going repairs to the banks and canals, but in recent years there has been a significant push to transfer all of the water being delivered "on farm" to an underground piping, pumping and monitoring arrangement. 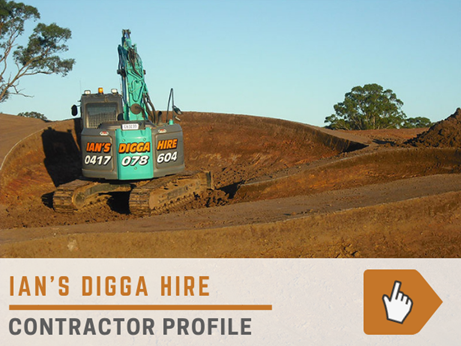 Ongoing environmental issues and a growing awareness of water conservation have been the main drivers of this change, but in doing so have opened up more opportunities for the earthmoving contractors of the region. Step up to the plate Doug North and his two sons Macca and Harry. When you meet this family you will notice immediately that the seed has not fallen far from the tree. 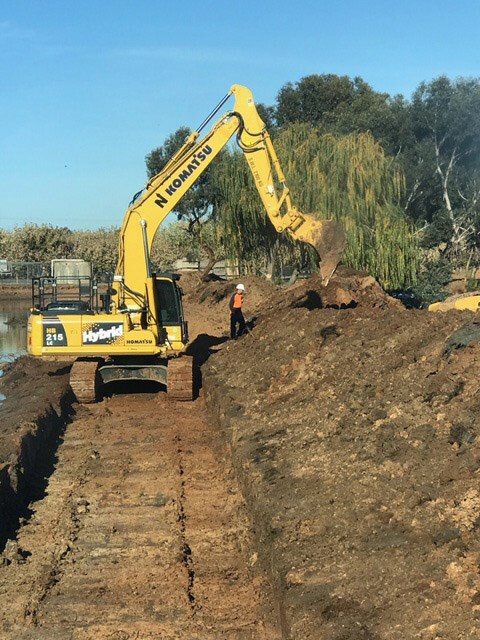 Stocky, strong country blokes with a good sense of humour and with a great work ethic has turned the "one man, one machine" business into a fleet of 8 x 20-ton Komatsu Excavators working flat out in an effort to keep up the maintenance of the existing canals. Plastic lining of designated new and old canals to avoid seepage and water loss is an ongoing concern as is the backfilling and remediation of selected canals and the digging of new trenches to assist in the installation of hundreds of kilometres of underground high density polyethylene pipe to replace the previously "open canals". 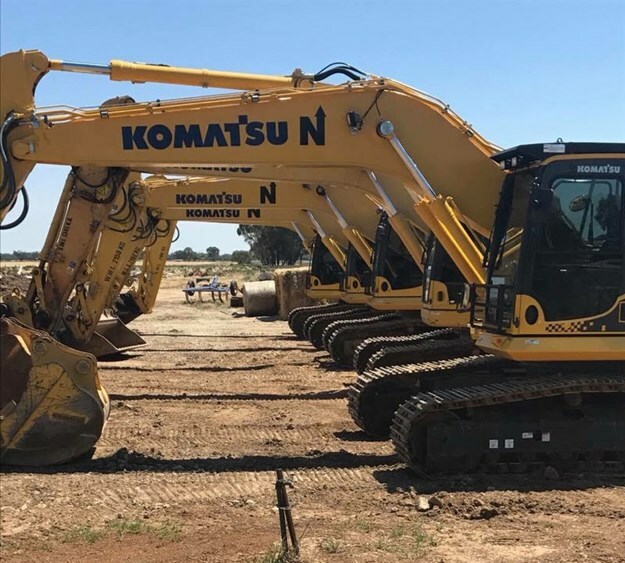 Complementing the fleet of eight Komatsu Excavators, North and Sons run a nice set up with a Kenworth Prime Mover and a Lusty tri-axle Spread Float. 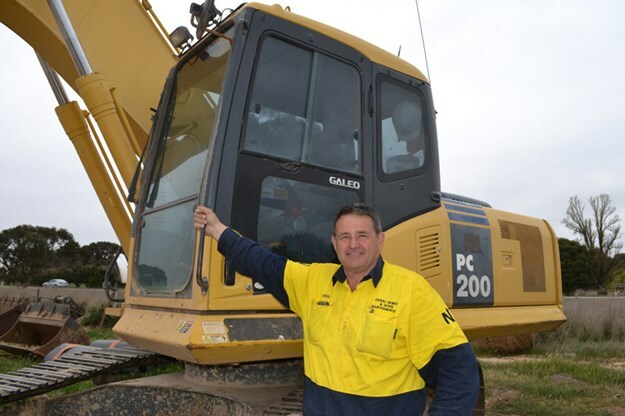 Doug is proud as punch of his boys and the way they are learning the ropes of running the business; they are really fully hands on in everything that is associated with the excavators and trucks. Doug has a nice 300-plus acre farm just out near Cohuna/Leitchville where runs a few head of prime beef cattle, does a bit of cropping and provides a brilliant service to the locals in an area many of us in Australia could only dream about. 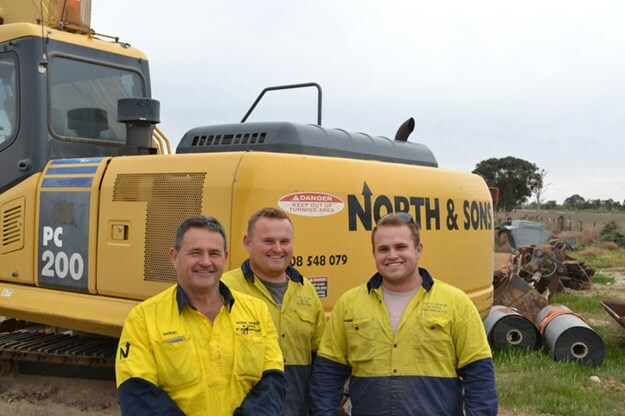 Having a good product like Komatsu has certainly helped Doug create his dream and with his sons on board it’s looking more like a "Dream Team" to me.